This page is dedicated to sharing or finding high performance True Sector Rotation Strategies developed by other members. It includes investment strategies for stocks, ETFs, and mutual funds, and includes a performance ranking for the safest conservative retirement investment strategies. Conservative strategy rankings consider return reliability and drawdown characteristics. These Strategies are freely shared "as is," and when imported become your own private copy to maintain. Strategies are evaluated nightly and included in the Strategy Hall of Fame according to the rules posted below. • Only Active Strategies that people actually use are included — no experimental strategies from the Sandbox section. • Only Strategies with names that do not begin with "My " will be included — use the "My " prefix to retain privacy. • Only the two best minor variations of an excellent Strategy will be listed to ensure that a greater variety can be shown. ten stocks with at least 15 years of data. The ''Safety'' performance rating is calculated as shown below. These are the best performing Mutual Fund Strategies having at least 10 years of performance history. leveraged funds, and may not contain any stocks or ETFs, except for these: GLD, IAU, SH, SH-, PSQ and PSQ-. The Bear Symbol may contain the leveraged long-term treasury ETFs UST- or UBT-, but not TYD- or TMF-. The ''Score'' performance rating and the weeks of honorable Hall of Fame listing are shown for each. funds. The Bear Symbol may contain the leveraged long-term treasury ETFs UST- or UBT-, but not TYD- or TMF-. (27.5) Look Mom - No Hands! (58.6) Look Mom - Safe Sects! These are the best performing Stock Strategies having at least 10 years of performance history. weeks of honorable Hall of Fame listing are shown for each. WARNING! You Must Be Cautious! Stock Are Not Like Sector Funds. rising stars. But, they are rising stars no longer. them together nicely for you. flat there will be another ready to take its place. your Strategy fizzles you'll be quite disappointed. should the current leader fail. I understand these problems and my duty. the Healthcare Sectors Portfolio page. I've read the material in both of these links. that often comes with rising star stocks. I'll take a look at leveraged ETF Strategies. I've read the blue-button warnings up above. Alright already! Show me those darn IDs! you use a new browser or computer. Surf Well Dude! permitted. The ''Score'' performance rating and the weeks of honorable Hall of Fame listing are shown for each. These Strategies include Shared Personal and Public Strategies listed in order of their use popularity. The ''Score'' rating for each Strategy and the percentage of members that hold each of them are shown. It's typical for mutual fund companies to create clones of their funds that differ only in the fees charged. For example, FELIX, FELCX, FELAX, FELTX, and FELBX, are all clones of FSELX, Fidelity Select Electronics. The assets of each are held and managed in common; just the fee structures and trade hold rules vary to better suit retail, advisor, custodial and institutional markets. Some companies, such as BlackRock, offer fund classes requiring minimum purchases as high as $1Million, or fund classes with fees on a sliding scale of the amount invested. If we have this information, you can see it in the Find-A-Fund popup and in the fund name when you put the mouse pointer over a ticker symbol. Strategies with fund hold times should use the Trade Automatic setting to abide by these limitations. Funds with 30-day hold periods, such as Fidelity Sector funds are no problem. Funds with holding periods beyond 60 days start to become problematic in a changing market and should be avoided if possible. Online brokers always provide hold time and early trade fee information. Verify that your funds reflect it properly. Read more HERE. 1st Rule: Commission-free trades for lame funds are never a good deal. 2nd Rule: $50 trading fees at a brokerage for prominent mutual funds is excessive. Consider an account at the mutual fund company. Fund Classes: Clones for Retail, Advisors, Custodians, and Institutions. It's typical for mutual fund companies to create clones of their funds that differ only in the fees charged. While the assets of each are held and managed in common; the fee structures and trade hold rules vary to better suit the retail, advisor, custodial, and institutional markets. Each fund company has its own class codes, and each has its own set of hold time and early trading fees associated with each fund class. Whether you select a Strategy of funds built by someone else or you select funds for your own Strategy, you must determine that each fund is actually available to you based on the class of customer you are. A name search on Yahoo Finance can help identify fund clones. Advisors and institutional investors are professionals who already know which funds are available to them. Employer sponsored 401k, 403b, and 457b, or like retirement plans, are managed by a plan custodian, usually a financial services company, which provides the employees with a fixed list typically having 10 to 30 funds from which they may choose to invest their retirement savings under the plan. Only from this fixed list of funds can one build a corresponding Strategy to manage the retirement savings. See examples HERE. If you manage your own IRA or taxable account you are classified as a retail investor. Generally (as with Fidelity) within a retail investment account you are allowed to purchase only the retail class funds. However, at some brokerages, such as E*Trade, a retail investor can mistakenly purchase advisor class funds, although their special trading rules and fees are always posted so they can be easily found. Ideal fund terms include no initial sales charge, no deferred sales charge, no minimum hold period, and no early trading fee. Funds with these terms exist, but generally impose a 90-day freeze on further trading if you buy and sell them in less than 30 days twice in a 90-day period. This isn't a problem for month-end trading Strategies. Likewise, funds with 30-day hold periods and early trading fees are also not a problem for month-end trading Strategies. Funds with front or back end sales charges must always be avoided! • Serial Diversification is like serial monogamy and is what SectorSurfer Strategies do by sequentially owning the one, and only one, best stock/fund of the Strategy's companies, sectors, or asset classes. Individual stocks and commodities have daily volatility risk as much as 3.5 times higher than the S&P500 and can suffer significant one day drops. A prudent investor risks no more than 20% of his assets in any one stock or commodity. Five Strategies produce useful Post-Surfing Diversification. Rotation implies something will be back time and time again, whereas fitting implies it has more sporadic properties that just happen to meet the current need. SectorSurfer's algorithm is agnostic as to which of these is really the case and simply strives to select the one best trending stock/fund of the Strategy. The question for investors is: "Does a superior past performance imply a superior future performance?" The answer lies in whether the performance was based on a rotational sequence or a fitted sequence. • Sector Rotation occurs as the economy cycles from boom to bust and back to boom again, favoring different market sectors during different phases of the cycle. These market sectors will still exist decades from now regardless of the fortune or demise of individual companies. The vast majority of investment capital never sits on the sidelines in cash, but rather continually sloshes from one favored sector to the next. • Individual Stocks are constituent components of sectors and asset classes, and thus inherently have a rotation component to their performance. However, the most successful growth companies typically have just one historical period when they truly were rising stars, doubling in value many times over a period of years. Eventually market saturation limits growth and they become a stodgy large cap stock, or lose their way and fizzle. Expecting a dozen past rising stars to be future rising stars truly is gold fever talking. The most obvious consequences for receiving Schedule K-1 is that (a) it complicates your personal tax return, and (b) that Schedule K-1 tends to be one of the last documents provided to taxpayers, which may potentially delay your tax filing. However, a more significant and potentially disagreeable tax situation can occur when an ETF is purchased near the end of one year and then sold in the next year. If the limited partnership does well in the year you purchased shares, it is possible that significant taxes could be payable even though you have not yet received any real financial benefits from returns. In fact the published share price for what you hold could even have gone down, but still the taxes will be due and payable because there had been a recognized profit or capital gain by the limited partnership earlier in the same year. The good news is that when you later sell the ETF (or ETN) your taxes will be adjusted by the formulas to compensate for what you had previously paid in tax such that the net taxes over the periods are adjusted to reflect the actual end-to-end returns received. Our TopDog Strategies page contains tabs for Strategies utilizing stocks from Canada, Australia, England, and Germany, that trade on the TSX, ASX, FTSE, and DAX exchanges respectively. The ticker symbols for the stocks traded on these foreign stock exchanges end in .T, .A, .L, and .D respectively for clear identification. 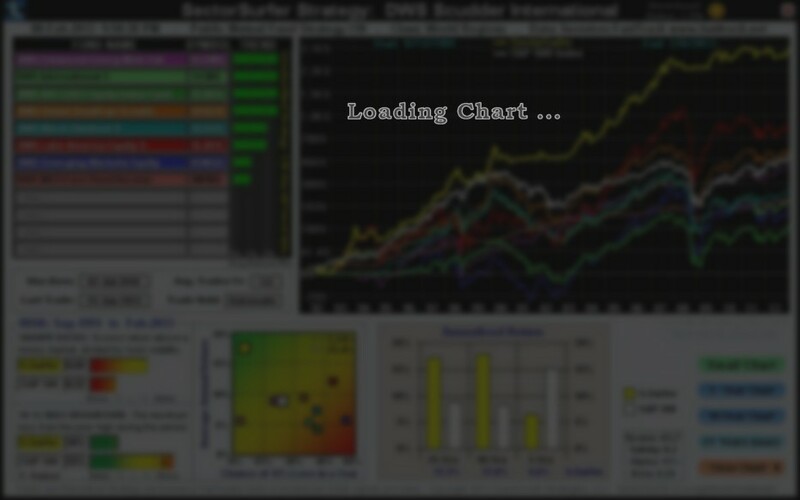 In the upper-left portion of the Strategy chart shown on the right, in addition to the .T suffix on each ticker symbol, the top bar contains a flag of the respective country and a note indicating that you must have access to trading stocks on a particular foreign stock exchange in order to make practical use of the Strategy. Some TopDog Strategies were designed for use by our customers in foreign countries and thus require the trading of stocks on the corresponding stock exchanges in those countries. While some foreign stocks are available in the U.S. as an ADR (American Deposit Receipt), they are generally thinly traded and often track their foreign counterparts with poor granularity, and thus are not recommended for use in U.S. SectorSurfer Strategies. Only very few brokerages in the U.S., such as Interactive Brokers, provides direct access to foreign stock exchanges. Foreign stocks are currently limited to the stocks of the following indexes: TSX-60, ASX-100, FTSE-100 and the DAX-30. A specific listing of stocks can be found on the TopDog Strategies page under the particular tab for the corresponding stock index. When a stock or a fund is "sold short," it means that you have sold something you don't have in your portfolio in order to bet against it — generally because you believe it is overpriced and will likely decline. For example, if you think the company SickCo will go out of business, you may want to bet against its stock by selling it short. Normally this means that the brokerage would "borrow" shares of SickCo from someone else's portfolio and leave them an IOU then sell those shares for you. Later you would buy them back at (hopefully) a cheaper price to book a net profit, and then restore the shares back to the other portfolio. In order to prevent more shares being sold than actually exist in the market, the brokerage is required to limit short sales to the number of shares their clients actually own. This rule is called the naked short selling rule. To make the process of short selling simple for an index or basket of stocks, the financial industry has created mutual funds and ETFs that are inherently "short" and have the inverse performance of their "long" brothers. For example, if you buy the ETF called SH (ProShares Short S&P 500), it will perform exactly the opposite of the S&P 500 index. The ETF called PSQ (ProShares Short QQQ) will perform exactly the opposite of the NASDAQ index. In IRA, 401K, or other retirement accounts, you cannot directly short stocks and ETFs, but you can purchase ETFs that are inherently shorted. Since SectorSurfer normally protects a Strategy in down-markets with StormGuard by going to $CASH, if you wish to use inverse/short funds during down-markets, you must enable them by adding "/i" to the end of the Strategy name as a signal to the algorithm to enable inverse funds and disable StormGuard. While you can’t directly apply leverage to stocks or funds in a retirement account, you can own inherently leveraged ETFs and mutual funds in a retirement account. It is because inherently leveraged funds actively adjust the margin back to a safe level daily that you can never go bust.